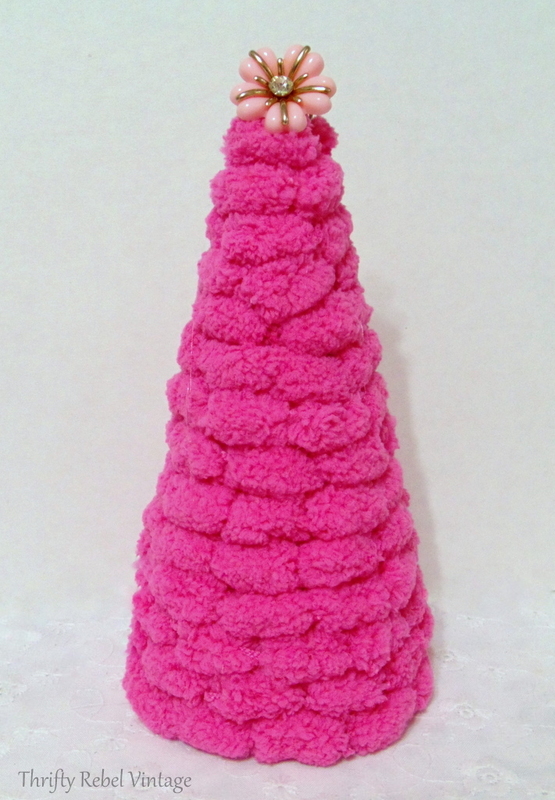 Do you love to make little trees for the Christmas season? Every year I make a different Christmas tree trio using whatever I happen to have in my stashes. 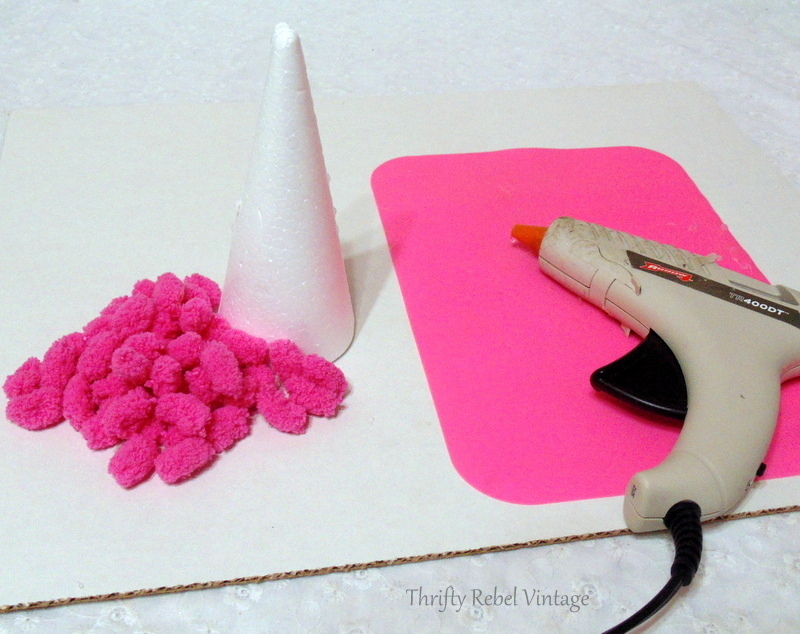 It’s fun, easy, and inexpensive because I’m using what I already have. Last year I shared my miniature rose tree with two different tree companions, and a few years ago I shared 3 very quick and easy scarf trees in my master bedroom Christmas decor. 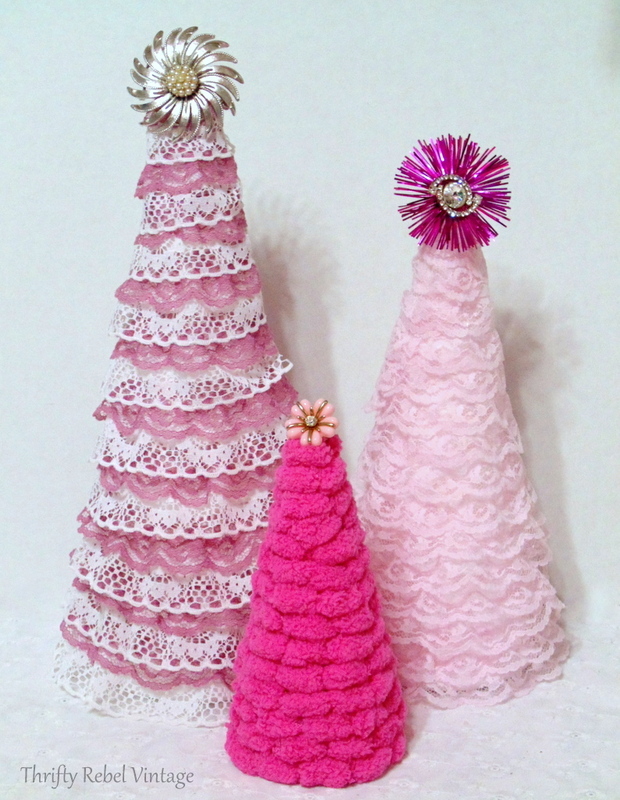 For this year’s tree trio I’m using some thrifted ribbon lace, the pink puff ball yard that I used in my repurposed thread spools garland, and 3 styrofoam cones. Just for fun I like each member of my tree trios to be different. 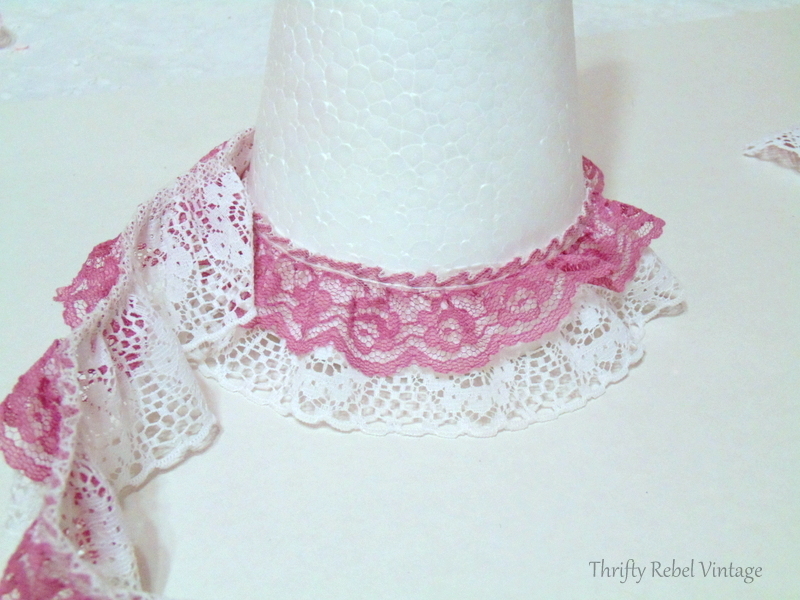 Like anything in home decor they don’t have to match, they just have to go with each other. 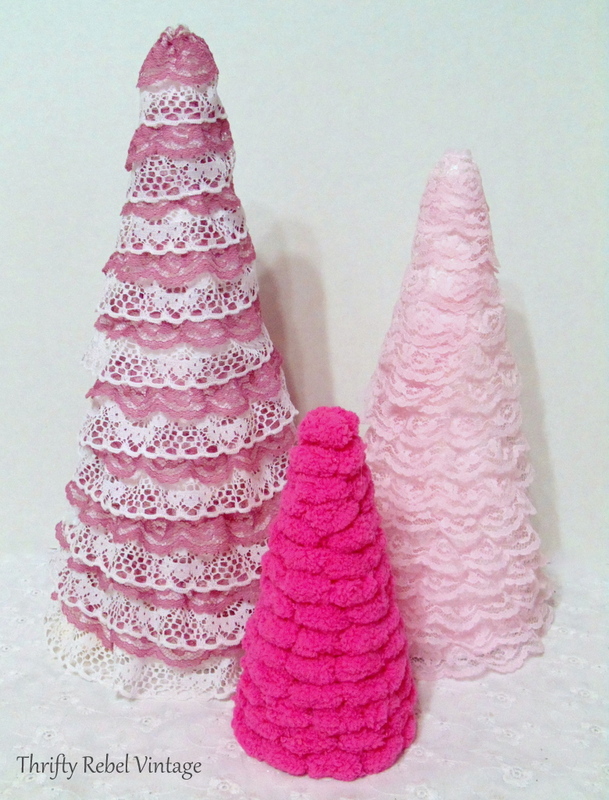 For my first ribbon lace tree I’m using the pink and white ribbon and the largest styrofoam cone. 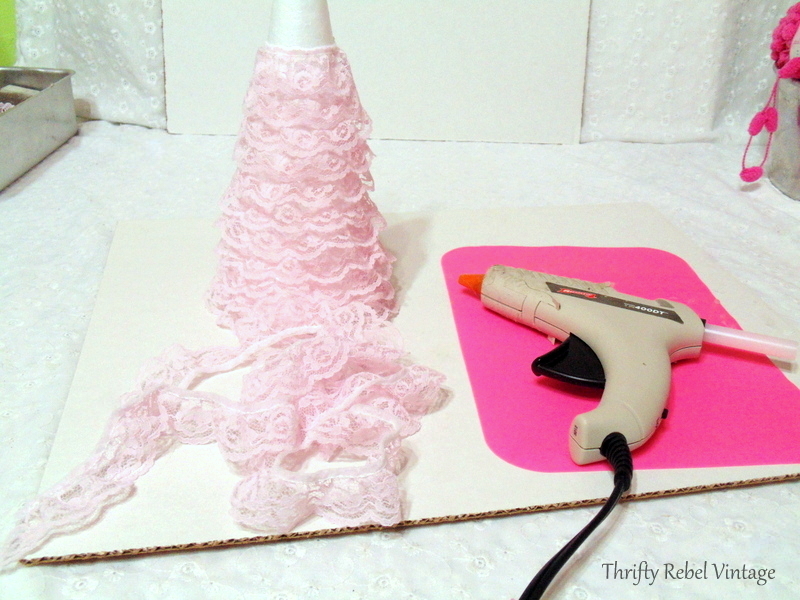 With my glue gun I stated attaching the lace around the cone. And I just kept going. 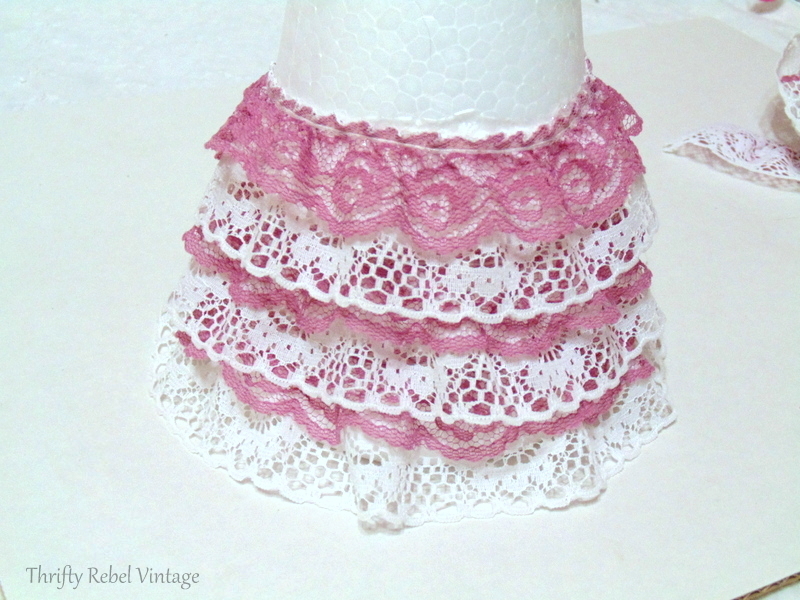 The medium sized cone got the light pink lace treatment in the same way. 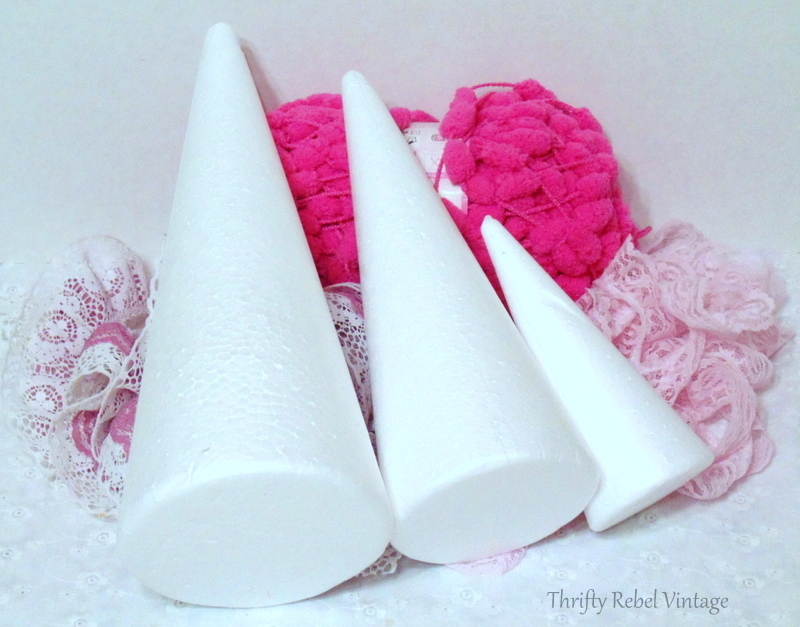 For the smallest cone I cut a whole bunch of the puff balls off of the yarn, and they were just glued on as well. 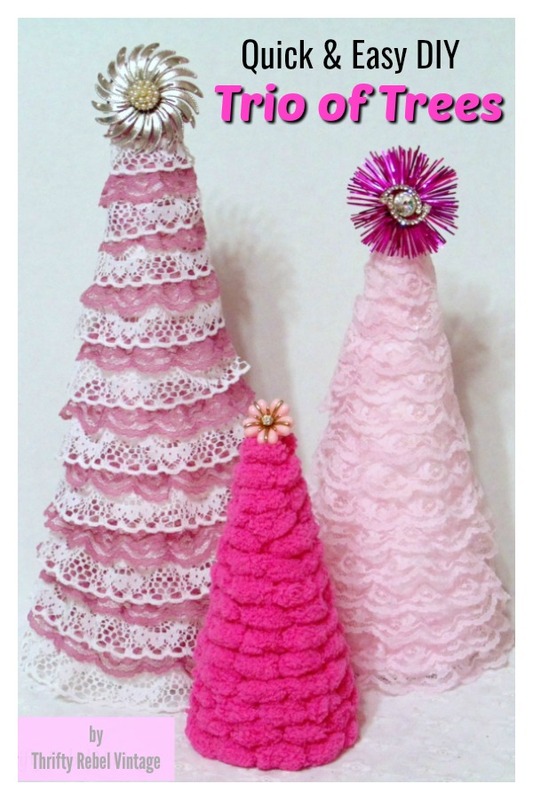 Here they are all done… my two ribbon lace trees and one puff ball yarn tree. These were so easy to make and took about 30 minutes in total. I scrounged through my stashes for some tree toppers. 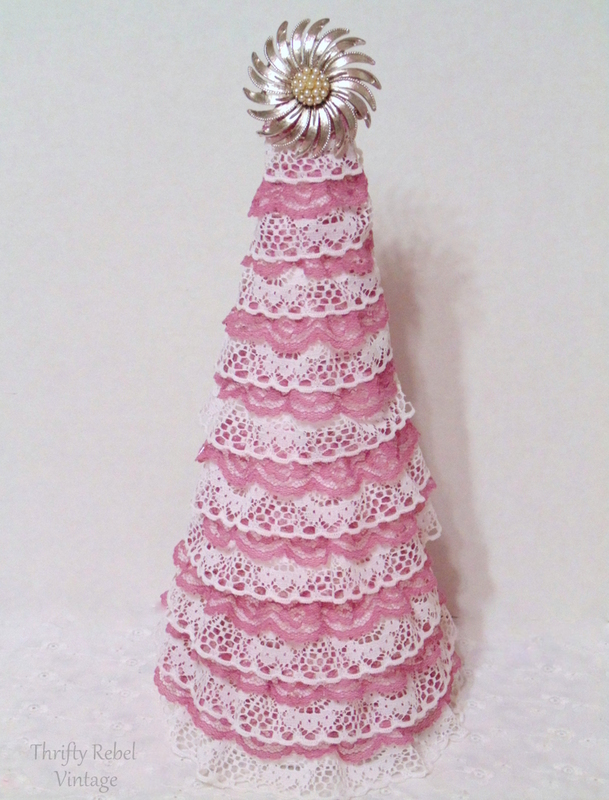 The large ribbon lace tree has a vintage silver tone and faux pearl brooch as it’s tree topper. 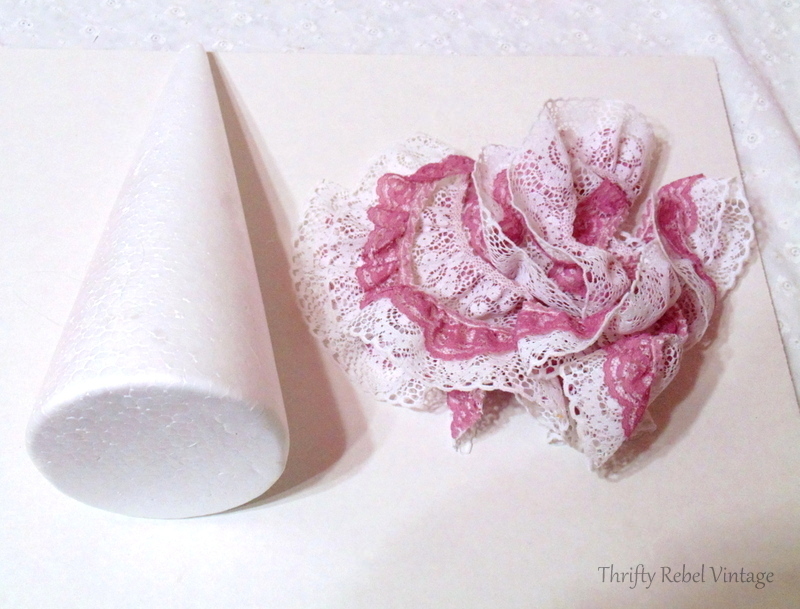 I simple pinned the brooch through the top of the styrofoam cone to hold it in place. 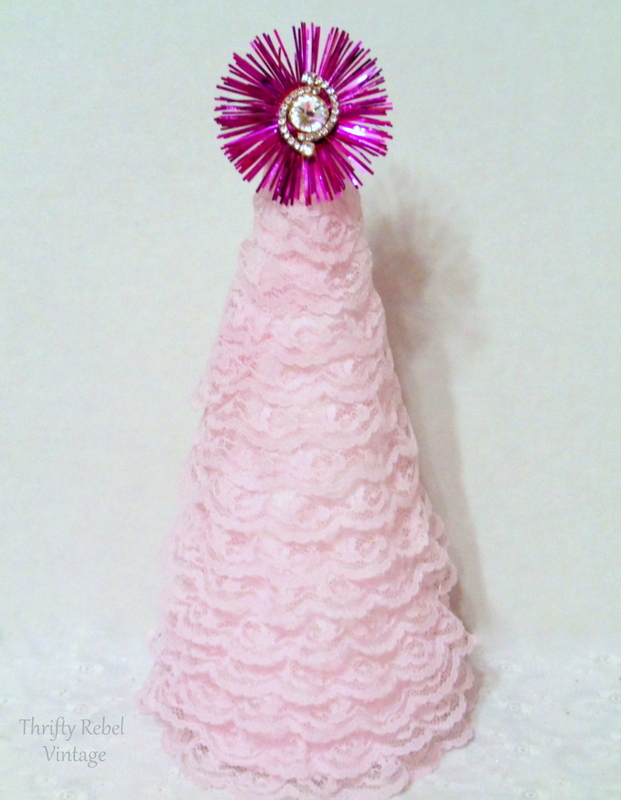 The light pink ribbon lace tree has a combo of a vintage rhinestone stud earring and the tinsel part of a pink light reflector as its tree topper. To hold it in place I just pushed the stud earring into the styrofoam. The sweet little puff ball tree has a piece of a vintage bracelet as it’s tree topper. This piece still has it’s bracelet links so I just bent them back and the piece sits on the top of the tree. Even though the tree toppers are fun…. I think I prefer them without. These little trees can be made using so many things. Check out your own stashes and see what you have to make your own tree trio. Save this idea for later by pinning to your favorite board. OMG those are just adorable! I don’t think the two pinks go together on the small tree. I do think all three are beautiful without the toppings, tho. Love your ideas. Beautiful. They are so cute. Thanks Colleen! I’m sure she would. They are gorgeous, with or without the toppers, but personally I LOVE them with the toppers! Oh these are GORGEOUS !!! So cute. I think my favorite is the little pom pom one. Thanks Debra! I think that’s my favorite too.